SASMOS HET Technologies Limited delivered the first F/A-18 Super Hornet electrical panel assembly on schedule and within six months from receipt of order to Boeing from its Bengaluru plant. 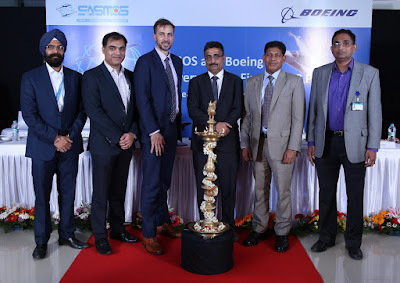 SASMOS is under contract with Boeing to produce mission-critical equipment and cockpit panel assemblies for its F-15 and F/A-18 fighter aircraft, an example of Boeing’s ongoing support of the country’s ‘Make in India’ initiative. With the aim of building a world-class aerospace ecosystem in India, Boeing is expanding its collaboration with Indian industrial partners across manufacturing, engineering and IT sectors. The company continues to increase its footprint as direct and indirect suppliers and sourcing activities continue to grow rapidly. Boeing has been active in India for 75 years with its commercial airplanes providing the mainstay of India’s civil aviation sector. More recently its military aircraft and services business have played an important role in the modernization and mission-readiness of India’s defense forces. Boeing is focused on delivering value to Indian customers with advanced technologies and performance driven aircraft underscored by lifecycle support services. Boeing is accelerating its manufacturing, skill development and engineering footprint in India forging the way towards building a strong and indigenous ecosystem, in support of the ‘Make in India’ initiative. Boeing is also shaping research and technical collaborations with Indian companies and institutions.